30 years ago, few people outside of PCA believed that downtown had the potential to be the emerging live/work/play urban center it is today. It was a core belief of longtime PCA President Barry Starr that energized public spaces were an essential ingredient for an activated downtown. 30 years ago, few people outside of PCA believed that downtown had the potential to be the emerging live/work/play urban center it is today. It was a core belief of longtime PCA President Barry Starr that energized public spaces were an essential ingredient for an activated downtown. It was Starr who, after the City of Phoenix obtained the prime acreage in an unusual three-way land swap, urged Mayor Paul Johnson to turn the underserved parcel into a signature city park. The park is named for Horace Steele, a local businessman who donated $2.5 million to construction costs. 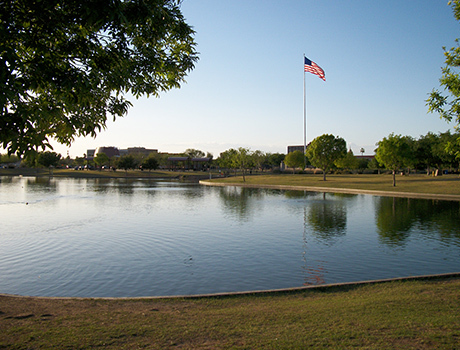 The park opened in 2001 and today hosts many large events like Arizona Strong Beer Festival, My Nana’s Salsa Festival, Phoenix Pride, Fabulous Fourth and debuting in 2017, Lost Lake Festival.